To be legal, aerial operations must comply with the principles of humanitarian law: military necessity, distinction, and proportionality: An attack or action must be intended to help in the military defeat of the enemy; it must be an attack on a military objective, and the harm caused to civilians or civilian property must be proportional and not excessive in relation to the concrete and direct military advantage anticipated. Article 25: The attack or bombardment, by whatever means, of towns, villages, dwellings, or buildings which are undefended is prohibited. Article 26: The officer in command of an attacking force must, before commencing a bombardment, except in cases of assault, do all in his power to warn the authorities. Article 27: In sieges and bombardments all necessary steps must be taken to spare, as far as possible, buildings dedicated to religion, art, science, or charitable purposes, historic monuments, hospitals, and places where the sick and wounded are collected, provided they are not being used at the time for military purposes. Although the 1907 Hague Conventions IV – The Laws and Customs of War on Land and IX – Bombardment by Naval Forces in Time of War prohibited the bombardment of undefended places, there was no international prohibition against indiscriminate bombardment of non-combatants in defended places, a shortcoming in the rules that was greatly exacerbated by aerial bombardment. With the rise of aerial warfare, non-combatants became extremely vulnerable and were inevitably collateral targets in such warfare potentially on a much larger scale than previously. World War I saw the first time strategic bombing was used when German Zeppelins and aircraft indiscriminately dropped bombs on cities in Britain and France. These nations who fought against Germany and its allies in the war retaliated with their own air raids (see Strategic bombing during World War I). A few years after World War I, a draft convention was proposed in 1923: The Hague Rules of Air Warfare. There are number of articles which would have directly affected how nations used aerial bombardment and defended against it; these are articles 18, 22 and 24. The law was, however, never adopted in legally binding form as it was criticized by all major powers as being unrealistic. The subordination of the law of air warfare to the law of ground warfare was arguably established by the Greco-German arbitration tribunal of 1927–30. It found that the 1907 Hague Convention on "The Laws and Customs of War on Land" applied to the German attacks in Greece during World War I: This concerned both Article 25 and Article 26. Jefferson Reynolds in an article The U.S. Air Force Law Review argues that "if international law is not enforced, persistent violations can conceivably be adopted as customary practice, permitting conduct that was once prohibited." Even if the Greco-German arbitration tribunal findings had established the rules for aerial bombardment, by 1945, the belligerents of World War II had ignored the preliminary bombardment procedures that the Greco-German arbitration tribunal had recognized. The German bombings of Guernica and Durango in Spain in 1937 during the Spanish Civil War and the Japanese aerial attacks on crowded Chinese cities during the Second Sino-Japanese War in 1937–38 attracted worldwide condemnation, prompting the League of Nations to pass a resolution that called for the protection of civilian populations against bombardment from the air. In response to the resolution passed by the League of Nations, a draft convention in Amsterdam of 1938 would have provided specific definitions of what constituted an "undefended" town, excessive civilian casualties and appropriate warning. This draft convention makes the standard of being undefended quite high – any military units or anti-aircraft within the radius qualifies a town as defended. This convention, like the 1923 draft, was not ratified, nor even close to being ratified, when hostilities broke out in Europe in 1939. While the two conventions offer a guideline to what the belligerent powers were considering before the war, neither of these documents came to be legally binding. At the start of World War II in 1939, following an appeal by Franklin D. Roosevelt, President of the neutral United States, the major European powers, including Britain and Germany, agreed not to bomb civilian targets outside combat zones: Britain agreeing provided that the other powers also refrained. (see the policy on strategic bombing at the start of the World War II). However, this was not honored as belligerents of both sides in the war adopted a policy of indiscriminate bombing of enemy cities. Throughout World War II, cities like Chongqing, Warsaw, Rotterdam, London, Coventry, Hamburg, Dresden, Tokyo, Hiroshima, and Nagasaki were struck by aerial bombardment, causing untold numbers of destruction of buildings and the deaths of tens of thousand civilians. After World War II, the massive destruction of non-combatant targets inflicted during the war prompted the victorious Allies to address the issue when the Nuremberg Charter was enacted, establishing the procedures and laws by which the Nuremberg Trials were to be conducted. Article 6(b) of the Charter thus condemned the "wanton destruction of cities, towns or villages, or devastation not justified by military necessity" and classified it as a violation of the laws or customs of war, therefore, making it a war crime. This provision was similarly made at the Tokyo Trials to try Japanese military and civilian leaders for illegal conducts committed during the Pacific War with the enactment of the Tokyo Charter. However, due to the absence of positive or specific customary international humanitarian law prohibiting illegal conducts of aerial warfare in World War II, the indiscriminate bombing of enemy cities was excluded from the category of war crimes at the Nuremberg and Tokyo Trials, therefore, no Axis officers and leaders were prosecuted for authorizing this practice. Furthermore, the United Nations War Crimes Commission received no notice of records of trial concerning the illegal conduct of air warfare. Chris Jochnick and Roger Normand in their article The Legitimation of Violence 1: A Critical History of the Laws of War explains that: "By leaving out morale bombing and other attacks on civilians unchallenged, the Tribunal conferred legal legitimacy on such practices." In 1963, the atomic bombings of Hiroshima and Nagasaki were the subject of a Japanese judicial review in Ryuichi Shimoda et al. v. The State. The review draws several distinctions which are pertinent to both conventional and atomic aerial bombardment. Based on international law found in Hague Convention of 1907 IV – The Laws and Customs of War on Land and IX – Bombardment by Naval Forces in Time of War, and the Hague Draft Rules of Air Warfare of 1922–1923 the Court drew a distinction between "Targeted Aerial Bombardment" and indiscriminate area bombardment, that the court called "Blind Aerial Bombardment", and also a distinction between a defended and an undefended city. "In principle, a defended city is a city which resists an attempt at occupation by land forces. A city even with defence installations and armed forces cannot be said to be a defended city if it is far away from the battlefield and is not in immediate danger of occupation by the enemy." The court ruled that blind aerial bombardment is permitted only in the immediate vicinity of the operations of land forces and that only targeted aerial bombardment of military installations is permitted further from the front. It also ruled that, in such an event, the incidental death of civilians and the destruction of civilian property during targeted aerial bombardment was not unlawful. The court acknowledged that the concept of a military objective was enlarged under conditions of total war, but stated that the distinction between the two did not disappear. The court also ruled that when military targets were concentrated in a comparatively small area, and where defence installations against air raids were very strong, that when the destruction of non-military objectives is small in proportion to the large military interests, or necessity, such destruction is lawful. Thus, in the judgement of the Court, because of the immense power of the atom bombs, and the distance from enemy land forces, the atomic bombings of both Hiroshima and Nagasaki "was an illegal act of hostilities under international law as it existed at that time, as an indiscriminate bombardment of undefended cities". In examining these events [Anti-city strategy/blitz] in the light of international humanitarian law, it should be borne in mind that during the Second World War there was no agreement, treaty, convention or any other instrument governing the protection of the civilian population or civilian property, as the Conventions then in force dealt only with the protection of the wounded and the sick on the battlefield and in naval warfare, hospital ships, the laws and customs of war and the protection of prisoners of war. A fair reading of the [Rome Statute], for example, leaves the objective observer unable to answer with confidence whether the United States was guilty of war crimes for its aerial bombing campaigns over Germany and Japan in World War II. Indeed, if anything, a straightforward reading of the language probably indicates that the court would find the United States guilty. A fortiori, these provisions seem to imply that the United States would have been guilty of a war crime for dropping atomic bombs on Hiroshima and Nagasaki. This is intolerable and unacceptable. In the post war environment, a series of treaties governing the laws of war were adopted starting in 1949. These Geneva Conventions would come into force, in no small part, because of a general reaction against the practices of the Second World War. Although the Fourth Geneva Convention attempted to erect some legal defenses for civilians in time of war, the bulk of the Fourth Convention devoted to explicating civilian rights in occupied territories, and no explicit attention is paid to the problems of bombardment. In 1977, Protocol I was adopted as an amendment to the Geneva Conventions, prohibiting the deliberate or indiscriminate attack of civilians and civilian objects, even if the area contained military objectives, and the attacking force must take precautions and steps to spare the lives of civilians and civilian objects as possible. However, forces occupying near densely populated areas must avoid locating military objectives near or in densely populated areas and endeavor to remove civilians from the vicinity of military objectives. Failure to do so would cause a higher civilian death toll resulting from bombardment by the attacking force and the defenders would be held responsible, even criminally liable, for these deaths. This issue was addressed because drafters of Protocol I pointed out historical examples such as Japan in World War II who often dispersed legitimate military and industrial targets (almost two-thirds of production was from small factories of thirty or fewer persons or in wooden homes, which were clustered around the factories) throughout urban areas in many of its cities either with the sole purpose of preventing enemy forces from bombing these targets or using its civilian casualties caused by enemy bombardment as propaganda value against the enemy. 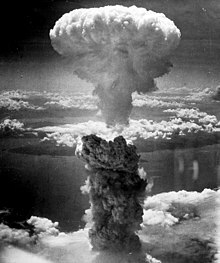 This move made Japan vulnerable to area bombardment and the U.S. Army Air Forces (USAAF) adopted a policy of carpetbombing which destroyed 69 Japanese cities with either incendiary bombs or atomic bombs, with the deaths of 381,000-500,000 Japanese people. The International Court of Justice gave an advisory opinion in July 1996 on the Legality of the Threat Or Use Of Nuclear Weapons. The court ruled that "[t]here is in neither customary nor international law any comprehensive and universal prohibition of the threat or use of nuclear weapons." However, by a split vote, it also found that "[t]he threat or use of nuclear weapons would generally be contrary to the rules of international law applicable in armed conflict." The Court stated that it could not definitively conclude whether the threat or use of nuclear weapons would be lawful or unlawful in an extreme circumstance of self-defense, in which the very survival of the state would be at stake. ^ a b c Gómez, Javier Guisández (20 June 1998). "The Law of Air Warfare". International Review of the Red Cross. 38 (323): 347–63. doi:10.1017/S0020860400091075. Archived from the original on 25 April 2013. ^ a b Laws of War: Laws and Customs of War on Land (Hague IV); 18 October 1907 available from the Avalon Project at the Yale Law School, entered into force: 26 January 1910. ^ International Review of the Red Cross no 323 cites: Charles Rousseau, References p. 360. "the a nalogy between land and aerial bombardment". ^ International Dimensions of Humanitarian Law, Volume 1. Brill Publishers. 1988. p. 115. ^ Judith Gail Gardam (8 April 1993). Non-Combatant Immunity As a Norm of International Humanitarian Law. Springer Publishing. p. 21. ISBN 0-7923-2245-2. ^ Tucker C. Spencer, Priscilla Mary Roberts. "World War I: A Student Encyclopedia". page 45. Routledge. '^ The Hague Rules of Air Warfare, 1922–12 to 1923–02, this convention was never adopted. ^ Howard M. Hensel (19 February 2008). The Legitimate Use of Military Force (Justice, International Law and Global Security). Ashgate. p. 194. ISBN 92-3-102371-3. ^ Roger O'Keefe (15 January 2007). The Protection of Cultural Property in Armed Conflict. Cambridge University Press. p. 50. ISBN 0-521-86797-5. ^ A. P. V. Rogers (1996). Law on the Battlefield. Manchester University Press. p. 53. ISBN 0-7190-4785-4. ^ Robert P. Newman (2011). Truman and the Hiroshima Cult. MSU Press. pp. 121–125. ISBN 978-0-87013-940-6. ^ Judith Gardam (21 July 2011). Necessity, Proportionality and the Use of Force by States. Cambridge University Press. p. 130. ISBN 0-521-17349-3. ^ State Crime: Current Perspectives (Critical Issues in Crime and Society). Rutgers University Press. 28 September 2010. p. 90. ISBN 0-8135-4901-9. ^ Myres McDouglas (18 August 1994). The International Law of War:Transnational Coercion and World Public Order. Springer. p. 641. ISBN 0-7923-2584-2. ^ Douglas P. Lackey (1 January 1984). Moral Principles and Nuclear Weapons. Rowman & Littlefield. p. 213. ISBN 978-0-8476-7116-8. ^ Bill Van Esveld (17 August 2009). Rockets from Gaza: Harm to Civilians from Palestinian Armed Groups' Rocket Attacks. Human Rights Watch. p. 26. ISBN 1-56432-523-7. ^ Library of Congress (2 October 2007). The Library of Congress World War II Companion. Simon & Schuster. p. 335. ISBN 0-7432-5219-5. ^ History of World War II: Victory and Aftermath. Marshall Cavendish Corporation. 2005. p. 817. ISBN 0-7614-7482-X. ^ The Law of Air Warfare - Contemporary Issues. Eleven International Publishing. 2006. p. 72. ISBN 90-77596-14-3. ICRC (27 June 2012), Commentary on the Declaration (XIV) Prohibiting the Discharge of Projectiles and Explosives from Balloons. The Hague, 18 October 1907., retrieved 25 October 2016 — Commentary on the early conventions including details not yet in this article.